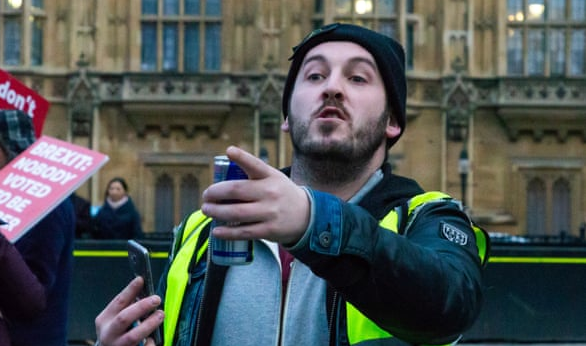 James Goddard, the thuggish self-styled 'Leader' of the Far Right 'Yellow Vests' Protests, who was arrested on Saturday in Manchester, has been officially charged with assault and a public order offence. He's due to appear before magistrates in Manchester next month. In a statement, Greater Manchester Police said he has been charged with a single count of assault and one count under the Public Order Act, namely using threatening or abusive words and behaviour with intent to cause fear or provoke unlawful violence. James Goddard, 29, of Kelvindale Drive, Altrincham, has been charged with assault and a public order offence. This morning police arrested a man aged 29 on suspicion of assault and public order offences, following a protest in Manchester City Centre on Saturday, February 9. The public order charge is of using threatening or abusive words and behaviour with intent to cause fear or provoke unlawful violence – an offence under section 4 of the Public Order Act 1986.